Below is the rush transcript of "This Week" on November 23, 2014. It may contain errors. UNIDENTIFIED MALE: ABC THIS WEEK -- city on edge. Ferguson bracing for that grand jury decision at any moment. Will Officer Darren Wilson be charged for killing Michael Brown? More protesters arrested overnight, as President Obama calls for calm in our ABC News exclusive. BARACK OBAMA, PRESIDENT OF THE UNITED STATES: We protest peacefully. UNIDENTIFIED MALE: Immigration showdown -- the president makes his move. His plan to grant legal status to millions of undocumented immigrants. This morning, answering our tough questions. GEORGE STEPHANOPOULOS, HOST: The speaker says you're acting like an emperor. UNIDENTIFIED MALE: And the race to replace the president. OBAMA: I think the American people, you know, they're going to want that new car smell. UNIDENTIFIED MALE: How he sees 2016 stacking up and what he'll do to keep his party in power. STEPHANOPOULOS: And we begin with the latest from Ferguson. Protests heating up again this weekend, but no decision yet from the grand jury on whether to charge Officer Darren Wilson for the shooting death of Michael Brown. We'll hear from President Obama in a moment. First, let's go to ABC's Steve Osunsami on the ground in Missouri -- good morning, Steve. STEVE OSUNSAMI, ABC NEWS CORRESPONDENT: Good morning to you, George. We're learning that the grand jury debating possible charges against Police Officer Darren Wilson will be getting back to work tomorrow. So it will be just a little bit more time before we see a decision in this case. Police have already put barricades up around the courthouse here, worried that demonstrators might storm the building. Police have been promised a 48 hour notice once that decision is reached. Already there have been plenty of street fights outside Ferguson police headquarters, which is ground zero for the protests here. Last night, there were even more arrests. We're told that the family of Michael Brown is very concerned about this. The Ferguson Action Network, another protest group, is promising demonstrations in at least 61 cities. Michael Brown's family and other religious leaders are calling for calm -- George. Now to our ABC News exclusive with President Obama, waiting, just like the rest of us, to hear from that grand jury, bracing for possible violence. STEPHANOPOULOS: Your FBI has warned about possible violence in the wake of that decision. What is your message to the people of Ferguson and others who are looking to protest? OBAMA: Well I think, first and foremost, keep protests peaceful. You know, this is a country that allows everybody to express their views. But using any event as an excuse for violence is contrary to rule of law and contrary to who we are. You know, part of what I have asked Eric Holder to do is to not just engage with the folks in Ferguson, but to engage nationally in a conversation between law enforcement and communities of color that oftentimes feel as if they not being treated fairly by law enforcement officials. Sometimes their concerns are justified. Sometimes they're not justified. Law enforcement has a very tough job. STEPHANOPOULOS: Are you worried here? OBAMA: You know, we saw during the summer the possibility of even overwhelmingly peaceful crowds being overrun by a few thugs. What I've done is called Jay Nixon, the governor of Missouri, to make sure that he has a plan to respond in a careful and appropriate kind of way to any potential violence, to be able to sort out the vast majority of peaceful protesters from the handful who are not. You know, in the end, what I have confidence in is that if we do a better job of training our law enforcement to be sensitive to the concerns of minority communities, then, over time, trust can be built, in part, because minority communities typically are subject to more crime. They need law enforcement more than anybody. And there are a lot of communities in my hometown of Chicago, for example, who actually want to see more police in, but they want to make sure that the police are trained so they can distinguish between a gangbanger and a kid who just happens to be wearing a hoodie but otherwise is a good kid and not doing anything wrong. STEPHANOPOULOS: One of your heroes, John Lewis, has suggested that if there's no indictment in this case, it would be a miscarriage of justice and another turning point like Selma. OBAMA: You know, I love John. I didn't see the quote, so I don't want to comment on what John specifically said. But I will say this, that the kinds of ongoing problems we have with police and communities of color around the country are not of the sort that we saw in Selma. We're not talking about systematic segregation or discrimination. They are solvable problems if, in fact, law enforcement officials are open to the kind of training that -- and best practices that we've seen instituted in lot of parts of the country. STEPHANOPOULOS: Do you think it would make sense for you to go to Ferguson after this decision? OBAMA: You know, I'm going to wait and see how -- how the response comes about. But, you know, what does makes sense is for not just me, but my entire administration, to work with willing partners at the state and local level to see how we can address some of these systematic issues. 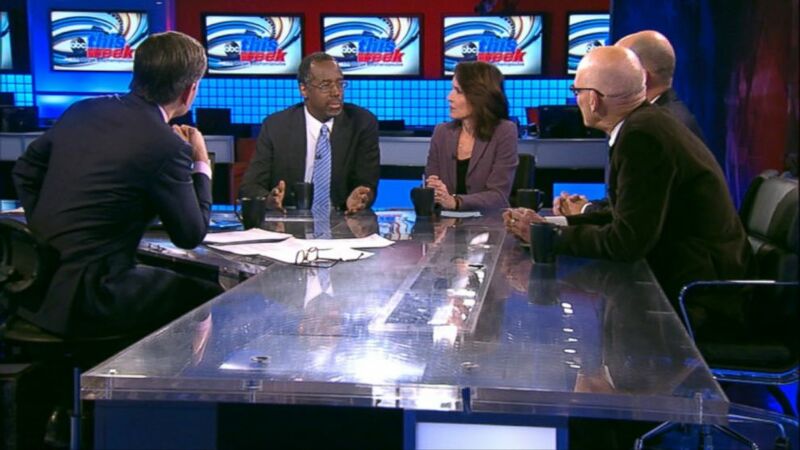 STEPHANOPOULOS: What about the broader issues of race? I mean I was struck by a poll I saw recently that said since 2009, the number of African Americans who think that race relations are getting has actually gone down. OBAMA: My own experience tells me that race relations continue to improve. If you think about, you know, just in our lifetimes -- we're about the same age -- where we've traveled, there's no way to say that somehow race relations are worse now than they were 10 years ago, 20 years ago or 50 years ago. OBAMA: ...which is a good thing. I mean, a good thing in the sense that it lays bare -- and I've said this before, as an African American male, there have been times where I experienced discrimination as a young man -- it's been a while since -- since it happened. And, you know, I think that folks on the other side of it might not understand why there are concerns or mistrust. And so when people start seeing these instances, then they start saying, OK, maybe we understand what we're talking about. But it's important not to overreact either or to suggest somehow that we haven't made progress. One of the things that I think the presidency drives home is, you know, in a democracy, progress is incremental. You know, and it goes in stutter steps and sometimes there -- you know, there's some backsliding. But the overall trajectory, I think, is positive. STEPHANOPOULOS: And the president will be back on immigration later. Now, let's get more on the federal response from our senior justice correspondent, Pierre Thomas. He's in Washington this morning -- and, Pierre, in addition to the grand jury, you've got these two parallel investigations done by the Justice Department on civil rights. PIERRE THOMAS, ABC NEWS CORRESPONDENT: You know, George, the stakes are high and the drama intense, as Justice Department officials wait for that grand jury decision. As you say, they've got two investigations underway. First, they're looking at whether the Ferguson Police Department discriminates against minorities. Justice officials have already indicated they believe there's evidence of bias, especially in traffic stops. They're also investigating Officer Wilson. There, they have a high threshold to reach before bringing any charges. They have to determine whether Officer Wilson's decision to shoot Brown was unreasonable under the circumstances. And they must find evidence Officer Wilson intentionally violated Brown's civil rights because of race. It's a vigorous investigation, but there's no guarantee as to how it will turn out (INAUDIBLE). STEPHANOPOULOS: And, Pierre, but if the grand jury doesn't -- finds that they don't believe that there's enough evidence to charge Officer Wilson with a crime, realistically, can the Justice Department go forward with their targeting of Officer Wilson? THOMAS: In theory, the state grand jury investigation should not impact the Justice Department. But George, I can tell you, there's a lot of pressure. The attorney general went to Ferguson and if that grand jury decides not to indict, in essence, the Justice Department decision becomes the final word in terms of a criminal case. Here in Washington, they know that this is one of the most important civil rights cases in recent memory. Race and policing, a volatile mix. Let's turn now to Michael Brown's family attorney, Benjamin Crump, and our own ABC legal affairs anchor, Dan Abrams. And Mr. Crump, let me begin with you. You've been told that you're going to get some kind of a notification about any grand jury announcement. BENJAMIN CRUMP, ATTORNEY FOR MICHAEL BROWN FAMILY: Nothing yet. STEPHANOPOULOS: So -- and how much -- how much advanced notice do you expect you would have? CRUMP: Well, we think about six hours is our hope, but we will have to see. The prosecutor's office has told us they will inform the family before they inform the public, for sure. STEPHANOPOULOS: OK -- and, Dan Abrams, let's walk through what the grand jury is doing right now. There have to be nine votes on a 12 person grand jury in order to indict Officer Wilson with a crime. DAN ABRAMS, ABC NEWS CORRESPONDENT: Right. Keep in mind, a totally different process than a regular jury. Nine out of 12, you're not deciding innocence versus guilt. This is just a question of probable cause, is there enough evidence to send this case to trial? Inside that grand jury room, much more casual than a trial. They're having a conversation in there. Grand juries are asking questions. But remember, it is the grand jury that is in charge of this. They're the ones who now can decide do we want to continue, do we need more evidence, etc.? And so they're considering everything from the possibility of no -- no indictment, involuntary manslaughter all the way up to murder. STEPHANOPOULOS: But this is different from a -- from your usual grand jury. Usually, you've got a prosecutor going in there saying I've got a case here, sign off on it. That's not what's happening here. ABRAMS: Exactly. Usually you have one or two detectives show up and you present a little bit of evidence and you say this is the charge we want and you move forward and you get the indictment. Here, the prosecutor is giving the grand jury all of the evidence, he says, allowing them to make all the decisions, having the target testify, which is unusual, calling in it seems one of the defense experts to even testify in front of the grand jury, which is unusual. It does seem that the prosecutor is to some degree trying to punt. But with that said, the prosecutor still has a lot of control over what evidence is presented in front of that grand jury. STEPHANOPOULOS: I saw you shaking your head. CRUMP: When you think about it, if this prosecutor is saying we're just going to be fair, we're not going to recommend any charges, that's different from anything he's done in his past 28 years with grand juries. So, now are we going to say he was unfair to all those people and he's going to be extra fair, get a police extra rights? Why can't it be equal justice. When our children are dead on the ground, why can't we have the same process? Why do you change the rules? Why you can't come in and recommend charges right now based on the probable cause. You said it yourself a minute ago, it's just probable cause. Seven people said his hands was up. ABRAMS: Let me ask you a question, if he's uncertain, right. If the prosecutor himself -- whether he's wrong or not -- let's assume he may be wrong or right -- but let's assume for a minute that he's uncertain as to whether charges should be filed. Then is he doing the right thing? CRUMP: Well, let's ask if the facts were changed, would he be uncertain? Because as the correspondent said, race and policing, that's the difference. When the race isn't the matter, the prosecutors change it. It's a symbiotic relationship with the prosecutor and the police. And if we keep doing the same thing, George, we're going to get the same results. And that's why the people are like they are in Ferguson. STEPHANOPOULOS: But I know that both Michael Brown's parents have called for calm. They don't want violent protests. But after the grand jury sifts through all this evidence, if they determine that there was a struggle and that Officer Wilson did have reason to feel threatened and endangered, do you accept that finding? CRUMP: Well, we have to accept the law, but think about it they're trying to snow everybody, George. The struggle at the car, he's running away. You have people saying he shot while he was running away. And that's one incident. STEPHANOPOULOS: But what if the evidence shows that he was running toward him? CRUMP: You know, you've got witnesses out there that say differently, then you've got the police version. So if you've got that tipping scale, then if you've got that tipping scale, probable cause, it should go to a jury where it's transparent and we have a trial by jury. Why do we accept that when the police kill our children we're just going to have this grand jury proceeding and it's different from anything else. ABRAMS: I'm not going to dispute with you on the facts, but let's talk about the process and the law, which is that there are a lot of high profile cases, and I've seen them, where prosecutors say, you know what, I'm going to hand this one to the grand jury. I want the political cover on this one. I want to let them decide so I'm not the one who takes the heat on this decision. So it is not sort of out of left field that in a high profile case a prosecutor hands it off to a grand jury to make that decision. STEPHANOPOULOS: It does sound like you've prejudged what the grand jury is going to say. Have you've already decided the process is unfair? STEPHANOPOULOS: But let me ask the question, what if -- let me ask you this, what if there was a struggle? What if there was a struggle for the gun and the evidence shows that? CRUMP: You know what, in America we have a constitution. You have a right to trial by jury. And I have no doubt if they were to indict the police officer, he will be guaranteed his full constitutional rights of innocent until proven guilty. He will get every benefit of the doubt. I don't worry about the due process for Officer Wilson, I worry about a due process for the little black boy dead on the ground. STEPHANOPOULOS: We're going to have to leave it there right now. We're all waiting for the grand jury. Thank you both very much. And coming up, more of our exclusive interview with President Obama. He takes on the critics and questions about his immigration decision next. And later, how is his relationship with Hillary play out through 2016. His most revealing answers yet. We're back in just two minutes. STEPHANOPOULOS: In this week's Closer Look, more from President Obama and his explosive order giving legal status to 5 million undocumented immigrants. OBAMA: I will never give up. STEPHANOPOULOS: We spoke moments after the president got a rousing welcome in Los Vegas and a stern review from the speaker of the house. BOEHNER: The president had said before that he's not king and he's not an emperor, but he's sure acting like one. OBAMA: Well, my response is pass a bill. STEPHANOPOULOS: But that didn't happen. STEPHANOPOULOS: He says that's not going to happen now. OBAMA: And the point is that ultimately, Congress has a responsibility to deal with these issues. And there are some things that I can't do on my own. STEPHANOPOULOS: But you have done more than you used to think you can do. You know several times over the last couple of years you were asked can you do more and you said nope, I am out of administrative flexibility, what changed? OBAMA: Well, that's not true. If you look George, I often times was asked: can you just halt deportations? And I said, no I can't do that. OBAMA: I'm not the emperor of the United States. My job is to execute laws that are passed... We've kind of stretched our administrative flexibility as much as we can. STEPHANOPOULOS: But do you have the right to make that decision on your own? STEPHANOPOULOS: But you know the response of both Reagan -- but in that case, there were bipartisan bills passed. They were acting after the bills were passed, not because Congress did not act. OBAMA: Well George I'm not sure that argues in favor. If Congress acted specifically and left something out and then a President goes ahead right afterwards and does more than Congress agreed to, it's actually not different. It's similar. The fact is is that we exercise prosecutorial discretion all the time. The primary response that I have to Speaker Boehner and others is go ahead and pass legislation. In the meantime, what we've got to make sure of is, number one, that our borders are secure. And number two, it's going to allow us to focus on the people that we really want out. Number three, what it allows us to do is to say to folks who have been here for a while, register. We're going to submit -- you're going to submit to a criminal background check and you're going to pay taxes. STEPHANOPOULOS: How do you respond to the argument, a future president comes in, wants lower taxes. Doesn't happen. Congress won't do it. So he says I'm not going to prosecute those who don't pay capital gains tax. OBAMA: Well, the truth of the matter is, George, that the reason that we have to do prosecutorial discretion in immigration is that we know that we are not even close to being able to deal with the folks who have been here a long time. The vast majority of folks understand that they need to pay taxes. And when we conduct an audit, for example, we are selecting those folks who are most likely to be cheating. We're not going after millions and millions of people who everybody knows are here. And we're taking advantage of low wages as they're mowing lawns or cleaning out bedpans and looking the other way. But then you've got politicians suddenly going out there saying -- suggesting somehow that, you know, we should be deporting all of them. Everybody knows, including Republicans, that we're not going to deport 11 million people. STEPHANOPOULOS: So you don't think it would be legitimate for a future president to make that argument? But what is true -- what is true today is we don't audit every single person, but we still expect that people are going to go ahead and follow the law. And we have limited resources. We have to make sure that we prioritize those folks who are most dangerous. And we should acknowledge what everybody has already acknowledged through their actions -- and Congress acknowledges through their budget -- which is we're not in the business of deporting millions of people or breaking up families. STEPHANOPOULOS (voice-over): The president seemed unfazed by dramatic warnings from top Republicans. OBAMA: There is often a lot of rhetoric coming out of Congress and in Washington. But it doesn't match up to what I think the American people expect. What the American people expect is that if we disagree on one thing, then we disagree on that thing. And then we work on everything else. And one of the habits that we've seen in Congress over the last four years, since the House Republicans took over, is that everything becomes hostage to one disagreement. So a couple of years ago it was Obamacare, the Affordable Care Act. And they decided we're going to shut down the government because we disagree with this one law. STEPHANOPOULOS: They say they're not going to do that this time. OBAMA: Well, if they're not going to do that, then we shouldn't have a problem. STEPHANOPOULOS: So is the president right? Our Powerhouse Roundtable weighs in next. Plus, James Carville, the latest from Team Hillary, Dr. Ben Carson on his own presidential plans and more from President Obama -- why he says the country is ready for someone new in the White House. STEPHANOPOULOS: We’re joined now by the Israeli prime minister, Benjamin Netanyahu. Mr. Prime Minister, thank you for joining us this morning. I know you’ve been in contact with Secretary Kerry through the weekend. Do you think there will be a deal? NETANYAHU: I don’t know, but I think it’s important that there won’t be a bad deal. A bad deal would enable Iran to remain with thousands of centrifuges which it could use to enrich uranium, which is what you need for a nuclear bomb. It could do so in a very short time. I think the key principle is this: Don’t dismantle sanctions before you dismantle Iran’s capacity to make a nuclear bomb. And as I understand it, the Iranians are nowhere near to accepting that. And if, for any reason, the United States and the other powers agree to leave Iran with that capacity to break out, I think that would be a historic mistake, not only because it endangers my country, Israel, that Iran’s ruler, the Ayatollah Khamenei, vows to annihilate, because – but also because I think it would endanger the entire Middle East and the world. STEPHANOPOULOS: So what options does Israel have if that kind of a deal is reached? NETANYAHU: Well, first of all, we’re doing everything we can to influence people not to make a bad deal, and of course such a deal is something that would leave Iran with the capacity to threaten everyone. You know, they’re developing ICBM’s, intercontinental ballistic missiles. Why in heaven’s name does Iran need intercontinental ballistic missiles? They don’t need those missiles to reach Israel. They need it to reach Europe and the United States. STEPHANOPOULOS: Do you agree with President Obama that this interim deal has been a success, and therefore, if you can’t get a big deal over this weekend, would you go along with extending the current terms? NETANYAHU: Look, I think the Iranians have used the interim deal to develop other elements of their program. It’s true that they haven’t raised the enrichment to the 20 percent level and beyond, but they have done other things and they’re doing things we don’t know about. In fact, the IAEA, the International Atomic Energy Agency, says that Iran refuses to divulge the elements of its secret military nuclear program. So I think Iran has been using the hiatus to improve its economy. Its economy has improved. Inflation has gone down substantially. There have been cash infusions of billions of dollars into the Iranian economy, but they’re still suffering under sanctions. I would in fact rather than making a bad deal, I would just continue the sanctions regime, even toughen the sanctions regime, and get Iran to make the concessions it needs to make to make sure that they don’t have the capacity to make nuclear weapons. STEPHANOPOULOS: Mr. Prime Minister, we all saw that horrific murder in the Jerusalem synagogue this week. Is Israel facing a new kind of intifadah? NETANYAHU: I hope not, but you can’t rule it out. I mean, what we’re seeing is that the radical Islamist fires that are sweeping everywhere in the Middle East are also coming to Israel. And in fact, this incitement is what has caused a lot of these murderous attacks on Jews where people are mowed down by cars or stabbed or hatcheted to death in a synagogue. In fact, there has been incitement that says that Israel – absolute falsehood coming from Islamist forces and also from Hamas, from ISIS, and from, regrettably from the Palestinian Authority, saying that Israel is about to change the prayer arrangements on the Temple Mount. That’s absolutely false. It’s hogwash. But you know, these people are incited by this. They then proceed to carry out their savage murders, and we have two weapons to fight this. One is we do whatever we can to defend ourselves and to strike at the killers. It’s hard, because many of them are suicide killers, and the second thing is to stop the incitement, to fight the incitement, including the incitement that comes from the Palestinian Authority. That has to stop. STEPHANOPOULOS: But does bulldozing houses work? NETANYAHU: Well, it’s one of the things that we’re seeking. We’re trying to find a way to stop, to deter futures suicides. Suicides by their nature, they don’t particularly care if they die, but they care if in some cases, and often in many cases, if their homes are demolished afterwards or sealed. That we’ve seen in some cases. We’re looking at other means as well, but just imagine what the American public would say if you had day in and day out, these terrorist murderers coming in, blowing up people, knifing people, running down people with cars. You’d want to look for the ways that are effective to deter such future attacks, both to protect people in real-time, but also to deter future suicides. And home demolitions is one of those means. STEPHANOPOULOS: Mr. Prime Minister, thanks very much for your time this morning. We’ll be right back.